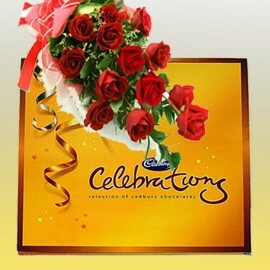 Make your special moments unforgettable; celebrate with style with our Roses Celebrations Hamper. This lovely gift hamper comprises of a stylish bouquet of 15 red roses put together artistically by our florist and a 193.5gms pack of Cadbury’s Celebration Chocolate. 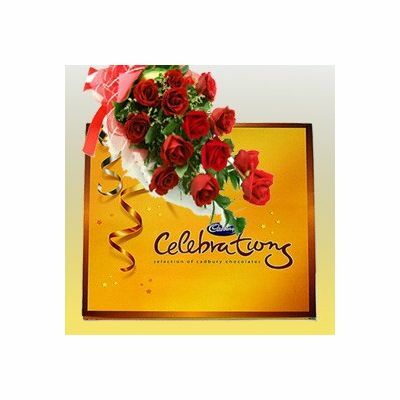 Send roses bouquet online and our colorful roses will convey your warm wishes beautifully. The Roses with Celebration hamper is an ideal gift for birthdays, anniversary, Mother’s Day, Father’s Day and for friends and colleagues too. Send flowers online as our hamper makes a perfect exam success and graduation and thank you gift.For your convenience, we do home delivery and same day delivery as well.